To understand the structure of the community, Grandjean identified a set of around 2.500 Twitter users and analysed the “who’s following who?” graph. The results show that, at first, the network of digital humanities on twitter is a form of small world. But a deeper analysis shows many other aspects which are worth to be investigate further, such as the relevance of linguistic differences in structuring the community. 1 – Your study is the result of an observation which lasted many months. In these months the number of digital humanities users in the twittersphere grew: in 2014 they were 800, in 2015 they became 1400, and in 2016 they are more than 2500. What do you think about this trend, also considering that the median user follows 59 Twitter accounts and is followed by 39 of them, and this is the bigger corpus of the community (63.1%) ? In the end of your analysis, do you think that the digital humanities community on Twitter is a young and open community, or a closed small world? Martin Grandjean: Meta-remark: the DH twittersphere did not grow from 800 to 2500 from 2014 to 2015, it’s simply that I made a big effort in listing them in 2015, and before the preparation of the article. Always keep in mind that this « harvest » is a very qualitative work (I discuss the implication of this work on the results in the article). So, yes, the DH community on Twitter has grown consequently in recent years, and this is not just because people discover the keyword « Digital humanities » and add it to their profile: Twitter is recognised as a place of sociability and exchange for this – very well connected – scientific group. While the overall number of Twitter users is not largely increasing, some communities, like the academics, journalists, etc., still use it widely. But by isolating such a community, there’s a risk of forgetting the network reality: even if the median DH user is following and followed by around 50 other « Digital humanists », he follows also hundreds of other accounts, and is followed by a variable number of people, outside the well-defined group! 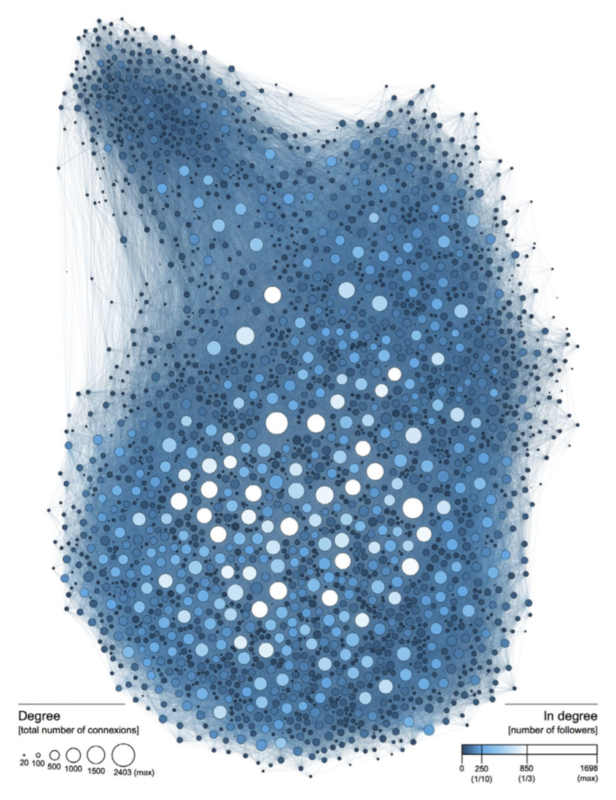 That’s why, even if the small world analysis is consistent when looking at the internal graph, the use of Twitter by this community is very open and integrative (as are the DH, where, because of transdisciplinary approaches, you always have to follow the news of your field but also of many others). 2 – From the analysis of linguistic communities, emerge two main clusters: the English-speaking and the French-speaking ones. Both seem to be internally homogeneous, but isolated externally. Considering data about Betweenness – the capacity of some users to act as bridges within the community – we notice a significant difference between the first 3 or 4 on one hand (your account, DH Summer Institute one, Frederic Kaplan’s and Digital Humanities Now – “the most followed account whose aggregation mission seems to be recognised by the community”) and the rest of the community on the other hand. In your opinion, to empower collaboration there would be the need of more bridge members or the linguistic factor is an obstacle that could not be overcome? Martin Grandjean: What is very interesting about the French-speaking accounts that have a high betweenness is that few of them are French, but Swiss or Canadian (and if they’re French, they’re not from Paris), countries where it’s much more acceptable to use another language to communicate. And that’s not only a matter of language skills, but also a necessity, when you come from a minority area: you have a need of outside contacts that you don’t have in a majority region sufficiently diverse and complete, where you don’t need to get out to find a specialist in a certain field. And concretely, a high betweenness is also a consequence of the high clustering of a certain community, not only an individual metric. The position of institutional accounts is normal: if they are references, then everyone will follow them. But for individuals, let’s note that voluntarily following people outside a language groupe is also a strategy to get to know researchers that we are likely to meet in person at international conference. It is very clear that most of the well-connected French and German speakers are also those participating to international associations and congresses. Note also that the French-speaking and the German-speaking DH associations are in the Betweenness top-10, as their role is to connect the communities together. And to take your question the other way: here the problem is not to be able to speak an international language to create relation (we all speak English already), but to be able to make (English speaking) people understand that some scientific fields are very likely to be influenced by non globalised languages and cultures. 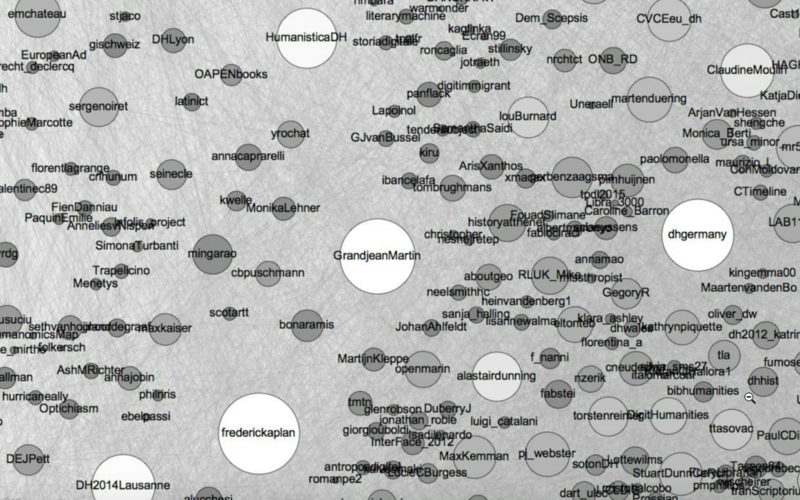 3 – Last but not least: Are you still observing the twitter digital humanities community? Can we expect a new paper with updated data in the coming future? Martin Grandjean: Yes, I am, but I’ll probably wait for a good occasion to produce a new version of this analysis, with another approach, like integrating all the followers (not listed as « DH ») or analysing the content of the tweets and comparing the « follower graph » with the « mention graph » to see if both are showing the same structure.